Milestones of Paleontology related Philatelic items. Biophilately- Club's Magazine of Biophilately Study Unit of American Topical Association. Michel catalog "Dino - whole world"
The first stamps issued in the mid-19th century have boring designs. They were rectangular or square in shape, depicted the leader of the country: king, queen, president, or had just a face value. Even though people around the world began collecting stamps almost immediately. The first philatelists tried to find production differences between stamps of the same design—color or paper variations, difference in perforation, some errors on images, etc. It took over 30 years until the first commemorative stamp was issued. In 1871, Peru issued a stamp showing a locomotive. Shortly after, many other postal authorities began issuing stamps dedicated to important events, local and worldwide famous places, landscapes, famous persons of the county, etc. Nowadays postage stamps are not only evidence of postal payment, but also ambassadors of the country. They tell us a story of the issuing country, shows us famous persons, landscapes and scenic sights, cultural and sporting events, and local flora and fauna. The fossilized remains of prehistoric animals, especially large ones, such as dinosaurs or giant mammals, have always stirred the imagination of people, creating all sorts of myths and legends about Dragons, Cyclops, and ancient Giants. The well-preserved remains of the ancient inhabitants of the earth have very great scientific and material value. Some of them even have the status of national treasure. This is, very likely, the very first philatelic item related to Paleontology. Neanderthal man as imagined in Chicago's Field Museum diorama circa 1920. 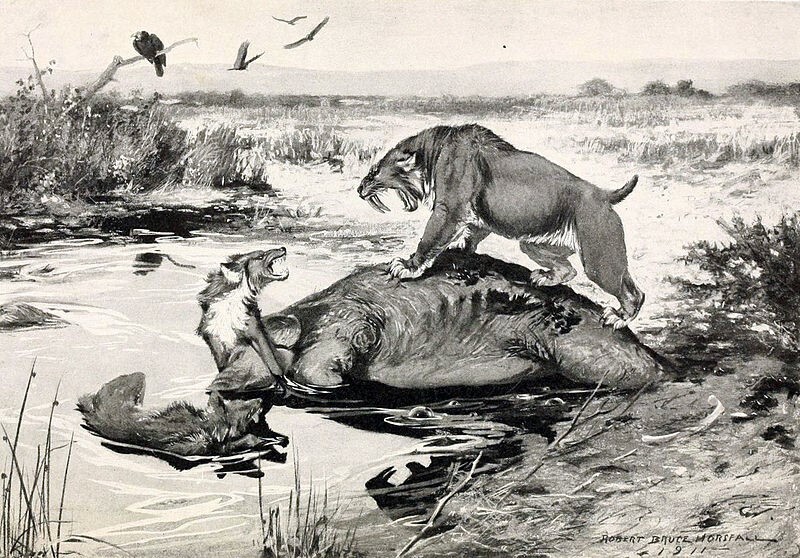 Illustration by Robert Bruce HORSFALL for “A History of Land Mammals in the Western Hemisphere“, by Robert BERRYMAN Scoot, 1913, shows a saber-toothed cat (Smilodon californicus) and a dire wolf (Canis dirus) fighting over a Columbian mammoth (Mammuthus columbi) carcass in the La Brea Tar Pits. The La Brea tar pits is very famous because of the huge range of fossils, especially of predators like Smilodon. By the way, Sabre tooth cat (Smilodon) is the heraldic animal of California and it designated as the official state fossil in 1973. Very strange use of fossils in today's point of view. P.S. Many thanks to fellow collectors Peter Brandhuber from Germany and John Noad from Canada for their help to find an information about the post stationery and some scans from their collections. The only earlier item that can be consider is a post card from Germany (Postcards without imprinted stamps are not subject of philately, but Deltiology). Dinosaurs, perhaps Plateosaurus, shown on its illustration and some Ad text underneath. The issue date of the postcard from Germany is unknown, sent in 1912 from Solingen. Plateosaurus lived during the Late Triassic period, around 214 to 204 million years ago, in what is now Central and Northern Europe. Discovered in 1834 by Johann Friedrich Engelhardt and described three years later by Hermann von Meyer, Plateosaurus was the fifth named dinosaur genus that is still considered valid. Although it had been described before Richard Owen formally named Dinosauria in 1842, it was not one of the three genera used by Owen to define the group, because at the time, it was poorly known and difficult to identify as a dinosaur. It is now among the dinosaurs best known to science: over 100 skeletons have been found, some of them nearly complete. The abundance of its fossils in Swabia, Germany, has led to the nickname Schwäbischer Lindwurm (Swabian lindworm). More info is on Wikipedia. From the nineteen thirties until the fifties, the Sinclair Oil Company used this meter franking, as well as regular advertisements to advertise their motor oil. They chose a dinosaur for a company logo as a symbol of the great length of time their oil spent in the ground. 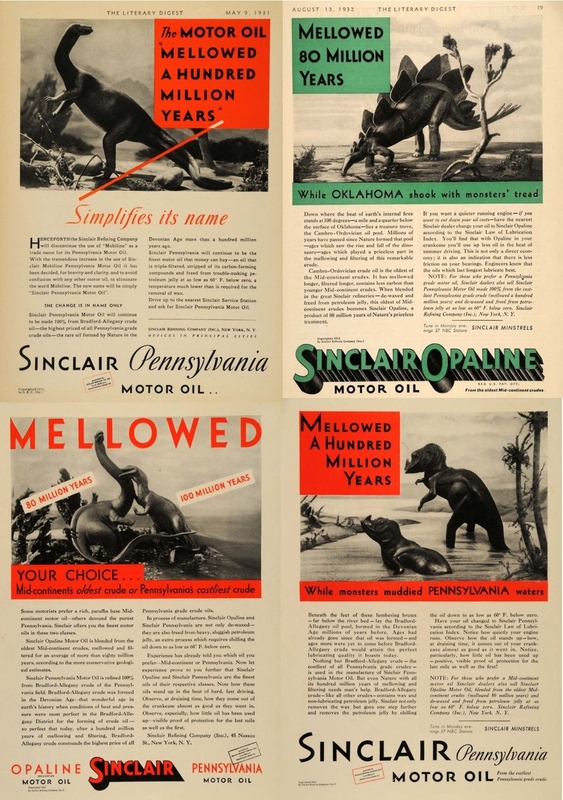 In 1935, 1938 Sinclair Refining Company run an ad compain. As part of it, they issued set of stamps-like labels (this kind of "stamps" known as Cinderella in philatelic community) depicted various dinosaurs. This is the first Cinderela set of stamps depicted prehistoric animals ever. These were intended for children. In each program when you went to a Sinclair station on week one you would be given a stamp album. Then on each 8 following week you would be given a new sheetlet of stamps. The books had some advertising material but mostly contained scientific and historical information to explain the dinosaurs and petroleum to children. On 10.08.1946, the U.S. Post Office Department issued a stamp to celebrate the centenary (100 anniversary) of the Smithsonian Institution. The stamp itself shows the Smithsonian's buildings in Washington (Actually this stamp itself can be consider as a stamp of paleontologic thematic as the Institute has very large Paleobiology Department). Several FDC with the Smithsonian stamp shows some Dinosaurs and other prehistoric animals on its illustrations. 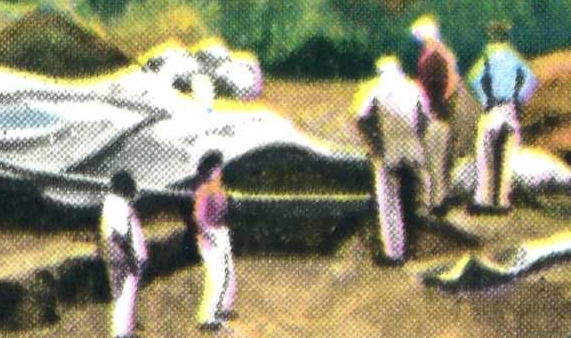 As illustration on the left side of the first FDC shows a sauropod, most likely a Diplodocus. Stegosaurs and Morophus shown on others. Note: all these FDCs are personalized (made by some dealers or individuals). US Post doesn't produce any FDC and don't make any commemorative postmarks associated with their stamps. On February 7, 1996 the U.S. Post Office Department issued a stamp to celebrate the 150 anniversary of the Smithsonian Institution. Similar to 1946, some dinosaurs can be seen on illustration of FDC covers. Here is one of them, shows Tyrannosaurus on it. Sometimes it is difficult to identify paleontologists on stamps, because they are shown on neutral background, or just a portrait. On other side, not every personalities shown on stamps with fossil or prehistoric animal on the background is paleontologist. The first stamp (known to me) shows a paleontologist has been issued in USSR on January 17, 1947. Actually it is a set of two stamps 30 kopejka(100 kopejka = 1 rubel), green and 50 kopejka sepia. These stamps are show a portrait of A.P. Karpinskij (1847-1936), who is most known as First elected president of Russian Science Academic. However, he was also great geologist and paleontologist, who made some important discovers at Ural mountains area of Russia. On 3 March 1952, Soviet Union issues a stamp titled "Greatest Russian scientist biologist-paleontologist: W.O. Kovalevskij" with a face value of 40 kopejka and this is actually the first stamp dedicated to paleontologist. Vladimir Onufreivich Kowalewskij (1784-1856) Russian paleontologist and supporter of Darwinism. He was the one who assumed horses are appeared first in Europe continent then migrate to North America, then come back to Europe. Evidence of this theorie found more then 100 years after his suicide due to some trouble in private and commercial life in Grube Messel by Darmstadt, Germany. Very little prehistoric horse in size of a big dog was found there and depicted on stamp of BRD in 1978. The first stamp of scientists with a prehistoric animal fossil on a background has been issued in Romania on 29 July 1967, as part of set of famous Romanian people. 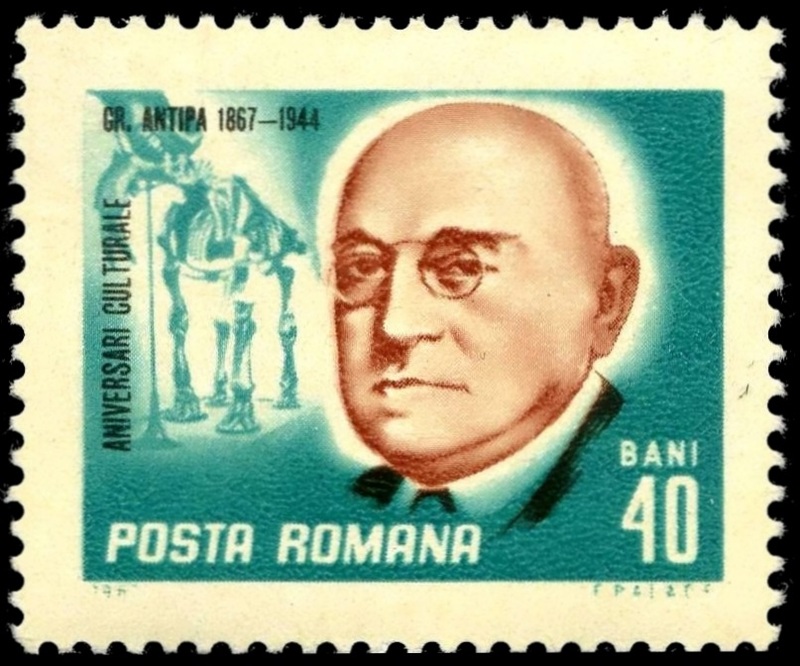 The green stamp with a value of 40 bani shows Romanian biologist and director of Museum of Natural History Grigores Antipa (1867-1944). Some websites and even philatelic books and catalogs mentioned this stamp as the first stamp depicted paleontologist on. Actually, he was not a paleontologist at all -hewas the zoologist, ichthyologist,economist, ecologist, oceanology, museologist. He founded the Romanian school of Hydrobiology, Ichthyology and Oceanology, was pioneer in the field of museology, the author of modern concepts in ecology, biosociologiei, biosphere. As director of the Museum of Natural History in Bucharest,he had an important contribution to the organization on a phylogenetic and ecological collections. As a token of gratitude for his work in the museum since 1933, the museum now bears his name. 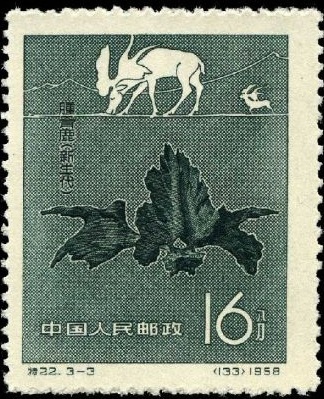 The confusion is caused by fossil of Dinotherium giganteumdepicted on a background of the stamp. It is there just because it isthe most impressive exhibit of the museum. Another category of persons to mention is "Contributors to Paleontological science"
People have found fossils since ancient times, but Paleontology as a science was established in the middle of the 19th century. The establishment was impossible without the help of scientists from many other sciences such as biology, botany, and geology. Many politicians and wealthy persons supported the young science. Modern biology, botany, and of course paleontology classifies all animals and plants according a taxonomic system proposed by Swedish botanist Carl Linnaeus (1707 - 1778) in the mid-18th century. The first stamp honoring Linnaeus was issued by Sweden on 2 June 1939. Means of Natural Selection, or the Preservation of Favoured Races in the Struggle for Life", in 1859. The fact that evolution occurs became accepted by the scientific community and much of the general public in his lifetime, while his theory of natural selection came to be widely seen as the primary explanation of the process of evolution in the 1930s, and now forms the basis of modern evolutionary theory. In modified form, Darwin's scientific discovery is the unifying theory of the life sciences, providing logical explanation for the diversity of life. In recognition of Darwin's pre-eminence, he was one of only five 19th-century UK non-royal personages to be honoured by a state funeral, and was buried in Westminster Abbey, close to John Herschel and Isaac Newton. Darwin's work had far-reaching impacts on the development of Paleontology, Antropology and many other Biology and Psyology related scients. One of most notable contributors to establishment of Paleontology science in United States was the third US President Thomas Jefferson, who is shown on many American and international stamps. The first stamp of Thomas Jefferson issued in US in 1851. Jefferson is rightfully renowned as the principal author of the Declaration of Independence, the Third President of the United States, and a champion of liberty. But he was also a central player in the beginnings of American paleontology. In addition, his participation occurred at a time when people were struggling with the ideas of fossils as evidence of past life, of extinction, and of an Earth far older than the Biblical account. Some of the objects of Jefferson’s paleontology became part of the collections at the American Philosophical Society in Philadelphia. Beginning in 1849, these holdings were transferred to the Academy of Natural Sciences of Philadelphia, where they are currently housed. This is the Thomas Jefferson Fossil Collection. Prince Albert I of Monaco, who had a keen interest in the origins of man and who founded the Institute for Human Paleontology in Paris that was responsible for a number of archeological digs, depicted on many stamps of Monaco and some international posts, start on 1891 when his portrait appears on definitive stamps. On 5 March 1949, the Monaco Post issued a set of 14 definitive stamps showing various areas of interest of Prince Albert I, who had a keen interest not only in fishing and sea/ocean explorer, but also in the origins of man and who founded the Institute for Human Paleontology in Paris that was responsible for a number of archeological digs. The Musée d'Anthropologie Préhistorique in Monaco (face value 40f). All stamps except the portrait of Prince Albert I, are the first stamps in their category. To commemorate the Indian Geological Survey centenary on 13 January 1951, India Post released a stamp showing two prehistoric “elephants” (Stegodon ganesa), the first ever reconstruction of a prehistoric animal on a stamp. Stegodons were primarily an Asiatic group of Mammutidae. This family is believed to have evolved sometime by the middle Miocene, nearly 15 million years ago, and became extinct by the late Pleistocene about 30,000–40,000 years ago. Stegodons appear to be transitional between true mastodons on the one hand and true elephants on the other. Why are Stegodons depicted on stamps for the anniversary of the Indian Geological Survey? In 1928, a three-meter long fossil tusk of an elephantine mammal (Stegodon ganesa) was discovered by Dr. Darashaw Nosherwan Wadia (1883–1969) who pursued his personal research on stratigraphy, structure, and paleontology of the Kashmir Himalayan region with single-minded devotion. Being a very keen observer, he worked towards identification of broad structural elements of the northwest Himalayas. The discovery of this skull, which was found in association with fossil ganoid fish and pteridospermous plants, led to the fixing of the age of an important geological rock formation in the Kashmir Himalayas to the Permo-Carboniferous period (355–250 million years ago). The fossil tusk is now kept at the museum of the Geology Department of the Jammu University. Note: On March 4, 2001 another stamp was issued by the Department of Post, Government of India , to commemorate 150 anniversary of Indian Geological Survey, but this time geological motive has been choose, the four color stamp shows some minerals. In 1952, Algeria issued the first stamp showing a fossil. issued two special stamps on 11 August to promote this event. The ammonite fossil depicted on the 15-franc stamp is Berbericeras sikikensis. The second stamp, denominated 30fr, shows one of the most famous geological sites in the country—the Hoggar Mountains. Ammonites are excellent index fossils, and it is often possible to link the rock layer in which they are found to specific geological time periods. Therefore, they appear on several philatelic items related to some geological events. The skeleton (bones) of a prehistoric animal appears for the first time on a stamp from the United States on 15 January 1955. The stamp was issued in conjunction with the sesquicentennial celebration of the Pennsylvania Academy of Fine Arts. The stamp pictures Charles Wilson Peale’s self-portrait, “The Artist in His Museum” (see on the right, the image is from Wikipedia) Many of the museum’s exhibits were collected by Peale, and he includes some of them in his painting. The stamp features several, like a wild turkey ready to be preserved as well as a great mastodon bone, in honor of one of Peale's greatest achievements—the reconstruction of a mastodon’s skeleton. 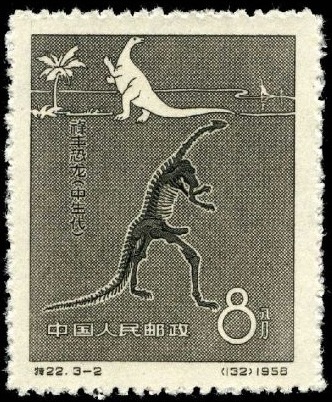 The 8-fen stamp depicts fossil and reconstruction of Lufengosaurus. Another two stamps, see on the right side, shows trilobite (Kaolishania pustulosa) of Haoli Mountain from Paleozoic and the Chinese giant deer (Megaloceros [=Sinomegaceros] pachyosteus) from Cenozoic. Lufengosaurus, meaning Lufeng lizard, is a genus of sauropod dinosaur from the early and middle Jurassic period of what is now southwestern China. It was named Chinese Paleontologist by C. C. Young in 1941. This is one of the few prosauropod dinosaurs to survive from the early Jurassic era. Prosauropods, meaning “before the sauropods,” were small, herbivorous dinosaurs closely related to the giant sauropods of the late Jurassic period. This dinosaur became the first complete dinosaur skeleton to be mounted in China and displayed in Beijing. Note: The FDC of this set is very rare, as it was issued in very small quantity. Between 1958 and 1961 Swiss Post, in cooperation with Pro Patria organization, issued four semi-postal stamp sets showing some fossils and minerals from the collections of local museums. Pro Patria is a Swiss patriotic and charitable organization. Its purpose is to give meaning to the Swiss national holiday, 1 August, by collecting donations to benefit social and cultural works of national public interest. One of the methods the organization uses to collect donations is the issue of semi-postal stamps. The first stamp set was issued in 1938. All sets contain five stamps: one stamp with a logo of the Pro Patria campaign and four stamps showing minerals and fossils. The additional amount paid for each sold stamp transferred to the organization. Actually, these are the first semi-postal stamps with a paleontological context ever issued. The set from 1961, distinguished from others, contains two fossil stamps: a fish and a plant. Both are the first stamps in their category. The fish is very likely Scorpaena porcus and the fern plant is probably Asterotheca meriani. Asterotheca is a genus dating from the Permian period 299–252 MYA. It grew in humid and swampy locales and was one of the first plants on the earth. Plant fossils are the subject of Paleobotany study. Paleobotany is the branch of paleontology dealing with the recovery and identification of plant remains from geological contexts, and their use for the biological reconstruction of past environments. It includes the evolutionary history of plants, with a bearing upon the evolution of life in general. Paleobotany is important in the reconstruction of ancient ecological systems and climate, known as paleoecology and paleoclimatology, respectively. It is also fundamental to the study of green plant development and evolution. The first colorful, pictorial stamps depicting prehistoric animals were issued on 5 March 1965 by Polish Post who liked to popularize discoveries of paleontologists. The set of ten stamps show representations of prehistoric animals, mostly dinosaurs. whose work during a remarkable career spanning five decades, played a central role in the development of paleontological reconstructions. Originally recognized only native Czechoslovakia, Burian’s fame later spread to an international audience, and a number of attempted emulate his style. Burian is regarded by many as the most influential paleo-artist of the modern era. 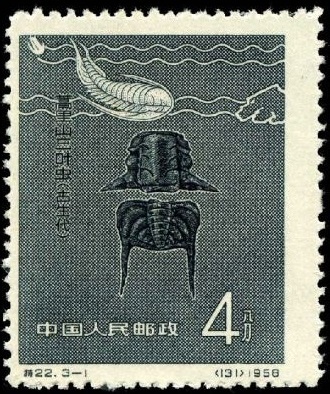 Many stamps issued around the world are based on his illustrations. 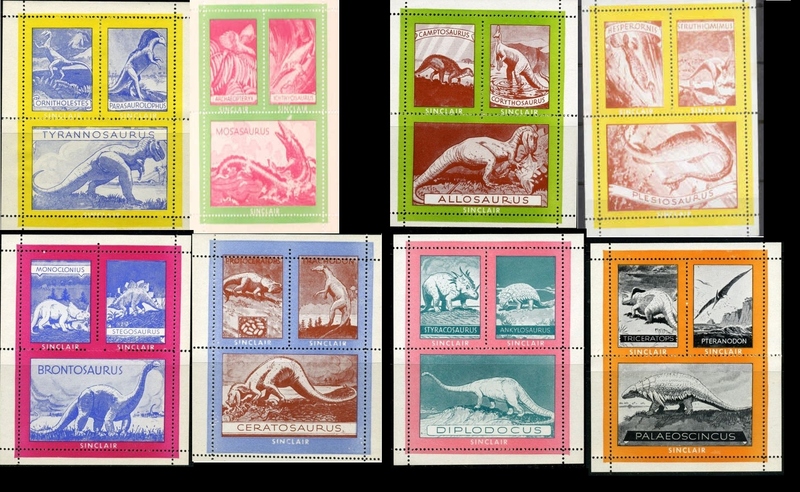 Only three months later the second pictorial set depicting prehistoric animals, also mostly dinosaurs issued in San Marino, similar to Polnish stamps design of these stamps also based on pictures of Zdenek Burian. In the following year Poland issues another stamps set with prehistoric animals from fish till mammoth that supposed to show animal evolution. The first stamps set dedicated to prehistoric mammals issued in the same year in Romania that shows reconstruction of the animals and their skeletons. The next stamps set of prehistoric mammals issued 5 years later only in Bulgaria. Also in 1965, the first stamp with an early human fossil came from Tanzania, the “cradle of humankind.” On 9 December, Tanzania issued a set of 14 definitive stamps with some typical animals, landscapes, and some historical episodes to show development of the country. 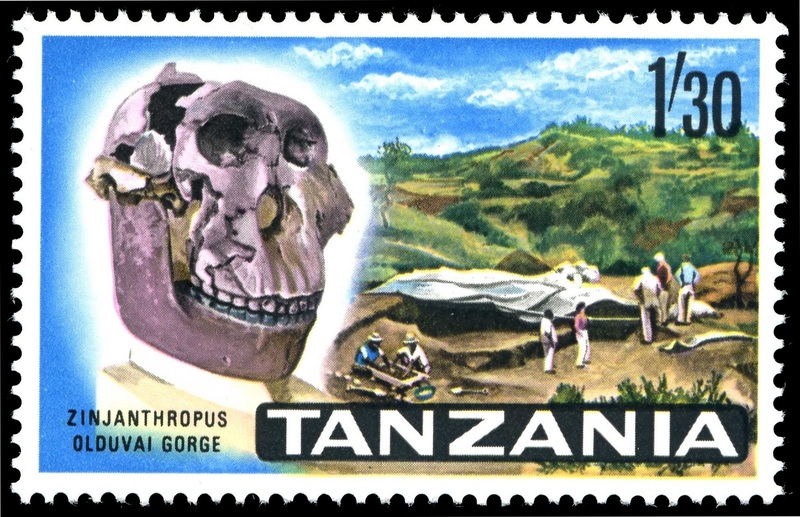 The 1.30sh stamp shows a skull of Zinjanthropus and its excavation site at Olduvai Gorge valley. Zinjanthropus, later categorized as Paranthropus boisei, is an extinct hominid postulated from a skull discovered in Olduvai Gorge, Tanzania, by British paleoanthropologist, Mary Leakey on 17 July 1959. Perhaps she is even depicted on the stamp. 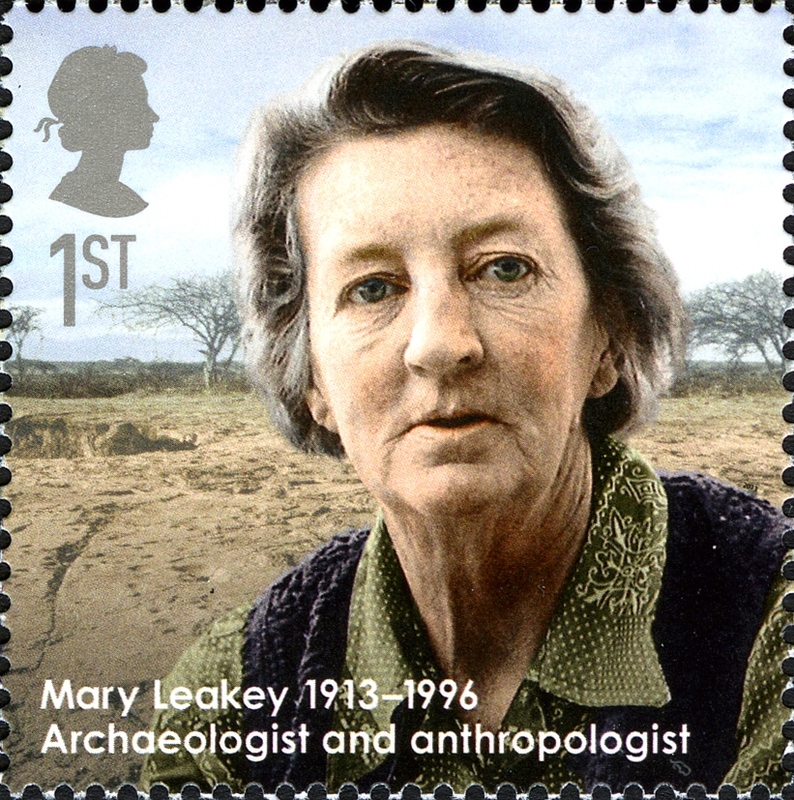 For much of her career, Mary Leakey (1913–1996) worked together with her husband, Louis Leakey (1903–1972), in Olduvai Gorge, uncovering the tools and fossils of ancient hominids. She developed a system for classifying the stone tools found at Olduvai. She also discovered the Laetoli footprints. It was there, at the Laetoli site, that she discovered hominid fossils that were more than 3.75 million-years-old. In addition, she discovered 15 new species of other animals, and one new genus. On 31 March 1967, Post Authority of Cuba issued a set of seven stamps that were the first to show human evolution. Each stamp shows a skull stage of the human relevant and depicts major stage of human development known from worldwide fossil record. The first two stamps show very early species: Homo habilis, who lived between roughly 2.8 to 1.5 MYA, and Australopithecus. From paleontological and archaeological evidence, the Australopithecus genus apparently evolved in eastern Africa around 4 MYA before spreading throughout the continent and eventually becoming extinct sometime after 2 MYA. Pithecanthropus erectus and Sinanthropus pekinensis both belong to the Homo erectus group that lived between 1.9 MYA and 700,000 years ago. Pithecanthropus erectus is known from fossils found at the bank of the Solo River at Trinil, in East Java. Fossils of Sinanthropus pekinensis, also known as Peking Man, are found in China. 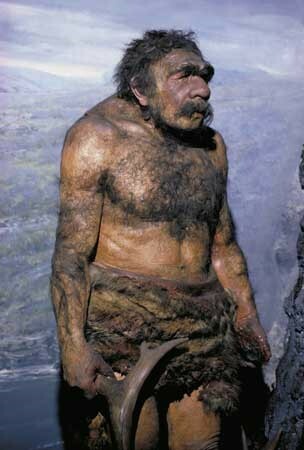 The Neanderthals, or Neandertals, are closely related to modern humans, differing in DNA by just 0.12 percent. Remains left by Neanderthals include bone and stone tools, which are found in Eurasia, from Western Europe to Central and Northern Asia as well as in North Africa. Neanderthals are generally classified by biologists as the species Homo neanderthalensis, but some considers them to be a subspecies of Homo sapiens (Homo sapiens neanderthalensis). The final Homo species shown on these stamps is the modern Homo sapiens. The 13c and 20c stamps show Cro-Magnon men. These are the first early modern humans that lived in Europe in the Upper Paleolithic period from 500,000 to 10,000 years ago. Current scientific literature prefers the term European early modern humans (EEMH). Fossils of this species are found in Italy, Britain, and even in Arctic regions. All stamps of this set use illustrations by the famous Czech painter and book illustrator, Zdenek Burian, from a book titled Prehistoric Man, published in 1960. On 5 January 1970, Lesotho issued a set of five stamps showing some footprints of dinosaurs and other prehistoric animals. 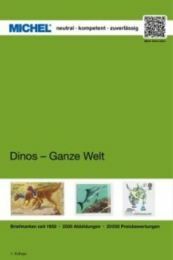 "Dinosaurs and footprints at Moyeni" (1st serie, the 2nd serie issued in 1984 and shows footprint of another three dinosaurs). Fossilized footprints of dinosaurs and other prehistoric reptiles, dated of about 200 MYA (upper Triassic period), found at Moyeni in the Quthig district of Lesotho. Four of five stamps shows not only the footprint but also reconstruction of the animals moved at sand and sea shore. Paleoichnology is the study of fossilized footprints. Scientists can learn many things from such tracks. They can give an idea about size of the animal and if it walked on two or four legs. The distance between the footprints can indicate the speed and behavioral of the animal. Many sites have been found with numerous tracks giving information on the social behavior of the animals, whether they traveled in herds, pairs, or alone. In addition to all of this, scientists can learn the animal’s foot anatomy and foot padding. Note: Even to date, almost 50 years after, there are very few stamps showing some footprints of prehistoric animals. On June 19, 1970 Polish Postal Service issued a post card to commemorate the 50th anniversary of the Polish Geological institute (face value 40 gr., quantity 100.000). The building of the institute depicted on the left side of the card. The imprinted stamp shows an ammonite of genus Perisphinctes, from collection of the institute. The ammonite is about 30cm in size and can be founded in various location in Poland. A trilobite of genus Marrolithus ornatus featured on a special post mark issued in Kielce. This blind trilobite is only 2 cm in size, probably borrowed in the mud of Ordovician sea floor(485-443 MYA) . Most stamps issued around the world have been rectangular or square shape. However, from time to time some post authorities produce stamps with other shapes. On Octber 31 1970, Angola issued a set of definitive stamps with title "Geology, Mineralogy, Paleontology" shows some minerals and fossils found in the country. All 12 stamps of the set have diamond shape. 0$50, Angolasaurus, skull and reconstruction, 2$00, Gondwanidium validum, 3$00, Stromatolites, 3$50, Procarcharodon megalodon tooth, 4$00, Microceratodus angolensis fossil, 6$00, Nostoceras helicinum, 10$00, Rotula orbiculus angolensis. Angolasaurus is an extinct genus of plioplatecarpine mosasaur. Definite remains from this genus have been recovered from the Turonian of Angola and some other places around the world. First named in 1964 by Miguel Telles Antunes on the basis of a partial skull and skeleton, exactly as depicted on the stamp. Another stamp to mention is 2$00, Gondwanidium validum - the first stamp of petrified plant. The first miniature sheets (or souvenir sheets) were issued before World.War II, usually with a surtax for raising funds for a charity rather than for sale to collectors. They became more of a collectors item with pictorial issues around 1970. In 1971 Manama issued the first stamp set with miniature sheet with a prehistoric animal. The set contains eight stamps showing various prehistoric animals, mostly dinosaurs, and a miniature sheet with a mammoth on a 10-riyal stamp along with some other prehistoric animals on the margin. The animal depicted on the stamp is a wooly mammoth (Elephas primigenius), a species that lived during the Pleistocene epoch from 2.588 million years ago (MYA) to 11,700 years ago, and was one of the last in the line of mammoth species. From the 1960s until the end of the 1980s, some small Middle Eastern countries (called “Sand Dunes” by philatelists) produced stamps in huge quantities for every popular topic: space, sports, famous people, etc. These stamps were aimed at stamp collectors rather than postal use and usually were never available in the country of origin to actually use on letters as postage. One such set is from Fujeira (1968). In the nineteen seventies and -eighties, rebel groups attempting to overthrow the Oman government took control over parts of the country on the Arabian peninsula. In order to raise funds and to establish themselves as rightful rulers, stamps were issued under the names 'State of Oman' and ' Dhufar'. In 1980, a set of prehistoric animals was issued under both names. Both issues consist of eight values in a sheet (perforate and inperforate ) and an inperforate miniature sheet. 'Used' covers exist, but all are addressed to a stamp dealer. Since then many companies and individuals have printed stamps depicting various prehistoric animals, mostly dinosaurs, using the names of non-existent countries to make money from inexperienced collectors. Traditionally stamps were printed in sheets of several postal authorities started to produce stamp sets on sheets. Such sheets were usually designed as a big picture composed of many different stamps. On one hand, it is nice to have a whole picture, but on the other hand, these occupy a large space in an album and are not useful for non-philatelist customers. The first sheet like this with a prehistoric theme was issued on 6 November 1990 by the South American country of Guyana. It contained twenty different stamp depicting South American prehistoric animals. By the way, most stamps of prehistoric animals thematic is issued by Guyana and have just one target - to be collected. Thre are no real story behund these stamps - just a nice colorfull images of dinosaurs and Co.
One of the most beautiful souvenir sheets depicting prehistoric animals, issued by the United States on 1 May 1997, shows a painting by the famous American paleoartist, James Gurney, author of Dinotopia. Distinguished from many artists who create very rough images of prehistoric creatures he worked very closely with leading paleontologists in order to create accurate reconstructions. One of the scientific advisers with whom Gurney consulted was prominent American paleontologist Jack Horner. Horner’s discoveries have significantly advanced our knowledge of dinosaurs. The scientist also served as a consultant for the Steven Spielberg films Jurassic Park and The Lost World. The First Day of Issue ceremony for the stamps was held at the Dinosaur Valley Museum in Grand Junction, Colorado, located in the heart of the world-famous “Dinosaur Triangle.” This area, which extends from western Colorado to northeastern Utah, has produced a wealth of dinosaur excavation sites. Another way to sell many stamps at once is in stamp booklets, widely accepted in many countries of the world. The first booklet with fossils was issued in Thailand on 1 January 1992. The booklet contains five mint stamps showing a dinosaur excavation and dinosaur skeletons. These stamps are part of set of four stamps dedicated to centenary of the Thai Department of Mineral Resources. The same year, on 9 September, the Swedish postal service issued a booklet with stamps of prehistoric animals consisting of two blocks of four stamps each. The booklet also contained some information about the animals. On 1 October 1993, three British Commonwealth countries (Australia, Canada, and New Zealand) simultaneously issued some sets of stamps showing dinosaurs and other prehistoric reptiles. All three sets were sold with a thematic stamp book, The Stamp of the Dinosaur, which also told the story of dinosaurs. Australian stamps issued in several formats: 6 mint stamps issued in separate sheets of 15, mini sheet of all 6 stamps. Two stamps from the Australian set were issued as self-adhesive and sold as a booklet of ten and in rolls. These first self-adhesive stamps of prehistoric animals shows the following prehistoric animals. Leaellynasaura, about the size of a chicken with a skull only 6 centimetres long, Leaellynasaura was a bipedal herbivorous dinosaur. Its eyes were exceptionally large, as was the part of the brain dedicated to processing visual signals (the optic lobes). It would appear to have been adapted for life in semi-darkness. During much of the Cretaceous, when Leaellynasaura lived, Australia was far closer to the South Pole than it is now, and would have been almost continuously dark for two or three months of each year. It has been suggested that this little dinosaur, too small to migrate,remained active throughout the long winter. Ornithocheirus, flying reptiles or pterosaurs were not dinosaurs. However, they lived at the same time and were warm-bloodedthe energy demands of flight could never be met with a cold-blooded metabolism. Ornithocheirus lived in the Late Cretaceous and is also found in Europe, South America and Africa. During the 19th century, in England many fragmentary pterosaur fossils were found in the Cambridge Greensand. First found in Australia in 1979, near Boulia in south-western Queensland. It was a coastal species, and had a wing span of about 2.5 metres. 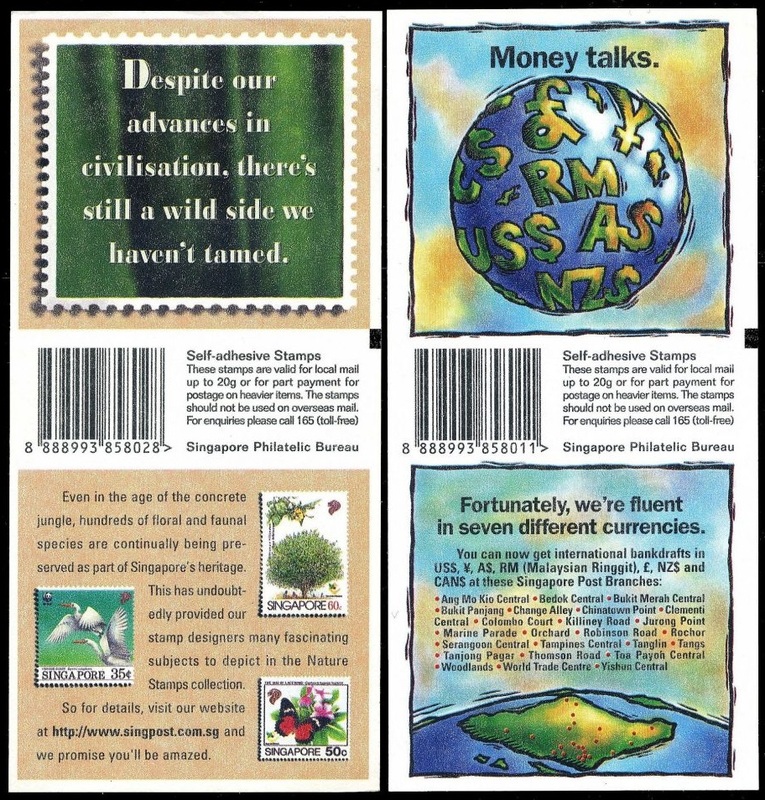 On 22 April 1998, the Singapore Post introduced the first automatic teller machine (ATM) stamps depicting dinosaurs. The sheet of 15 stamps, with "For the local address only" face value, was sold exclusively via OCBC (Oversea Chinese Banking Corporation) bank terminals for a limited period of time. The sheets were designed with exactly the same dimensions (156×74 mm) as the SGD 50 currency note and very thin (less than 0.13 mm) so that they could be issued through the same aperture. These stamps are also the thinnest stamps related to Paleontology. Within that period, two different designs of the backside were issued, as shown on the right.. The Pentucerutops ("five horned face") belongs to the family of Cerutopsidae. They looked like the rhinoceros and were plant-eaters with huge heads, bulky bodies and heavy limbs and hooike claws. The Apatosaurus ("deceptive lizard") was from the family of Diplodocidae. The Diplodocids stood highest at the hips, earing weight upon their elephantine limbs with short broad "hands" and feet. The Apatosaurus were plant-eaters which existed in the Late Iurassic period, and were very large with long whiplash tail and long neck. The Albertosuurus ("Alberta lizards") was related to the Tyrannosaurus (or T-rex) featured in the movies. They were fierce predatory animal that ran fast and they would lunge with their heads to take "scoop bites" from their victims bodies. Next year, in November 1999, the Postal Services of Portugal introduced a new set of Frama machine labels titled “Dinosaurs of Portugal”, shows some dinosaur species and some of their footprints found near Lourinha city. The area of Lourinha is known by the Late Jurassic findings of dinosaurs and other fossils, and give the name for Lourinh Formation. FRAMA labels are variable value stamps issued by a machine similar to an ATM. The user chooses the value at the time the stamp is dispensed. They are very similar to meter stamps. 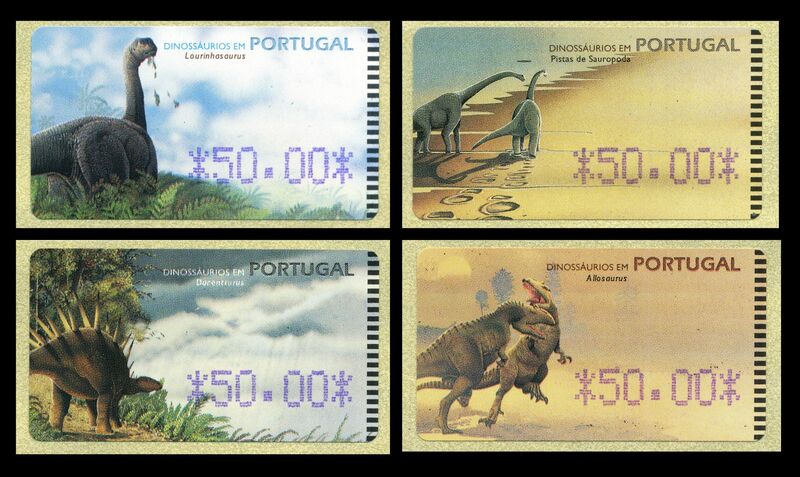 Another ATM-FRAMA of dinosaurs issued by the Postal Services of Portugal in 2015. So far (2017) only Portugal issued ATM-FRAMA stamps with prehistoric animals. These stamps had seven predefined values from PTE 50 to PTE 350 and printed in two different ATM machines: Amiel and SMD. Amiel machine used big and bold font, SMD printed the text in small, regular font. Some machines used black ink rather than blue one , such stamps are very difficult to get. Moreover ATM machines at philatelic desk of Portuguese Post programmed differently as ATM machines at post offices. Stamps sold to philatelist used a dot (".") as currency separator, when stamps sold at post offices used a comma (",") as currency separator, therefore mint stamps with comma separator are more difficult to get. With introduction of common European currency the ATM machines were reprogrammed to print face value in Escudo and Euro currency in 2000 and Euro only in 2002. The first 3D stamp set has been issued by South Africa in 2009. The South African Post Office is combining pre-history with modern technology by using the anaglyph method to create a three-dimensional effect. This set of stamps is the first ever with a 3D effect to be issued by the South African Post Office. It will also be the first time that a pair of viewing glasses will be supplied with each stamp sheet and commemorative cover. An anaglyph is a stereo image that requires special glasses with red and green (or blue) lenses for 3D viewing. To achieve the effect, two views of a picture are printed in two colours, usually red for the left eye and blue or green for the right eye. There are two mini-sheets 4 and 6 stamps each as well as two FDC cards. Five of the stamps depict skeletons of different types of dinosaurs, while the other five stamps show images of what scientists believe these creatures most probably looked like. All the dinosaurs depicted on the stamps have an African connection. Traditionally perforation of stamps made of small holes evenly distributed around the stamp. Since 2000 , for security reasons, some Post Authorities start use some odd forms at stamps perforation. On 05th o f August 2010, Korean Post issued the stamp set "The Age of Dinosaurs Series (1st Issue)" with perforations in the shape of dinosaur. In the following years Post of South Korea issued two more sets of dinosaurs with similar perforations (2011, 2012). On 5 March 2015, Switzerland issued a 2-swiss franc souvenir sheet containing one irregularly shaped stamp depicting an ammonite fossil along with an image showing a reconstruction of how the creature may have appeared when it was living. On 05th of June 2012, Post Authority of Turkeey issued a stamp set "World environment day (Dinosaurs)".The set is a mini-sheet of 4 stamps. Additionally, souvenir book with one more plastic Lenticular (3d hologram-motion) stamp and several post cards are printed out. The Lenticular stamp, depict running T-Rex is the first Lenticular depicted dinosaur on it. Even though it sold with the booklet only is a valid post stamp, and can be used for postage, see on the right. On 20 February 2014, Post of Hong Kong issued stamps set “Chinese Dinosaurs”. At present, China has over 170 recorded dinosaur species. Hong Kong Post issues a set of six special stamps on "Chinese Dinosaurs" which introduces six unique Chinese dinosaur species, with a view to enhancing the public's understanding of Chinese dinosaurs. On 19 May, 2017, Post of China issued stamps set “Chinese Dinosaurs”. This set is printed with a luminous effect that makes the unique features of the Chinese dinosaurs glow in the dark. 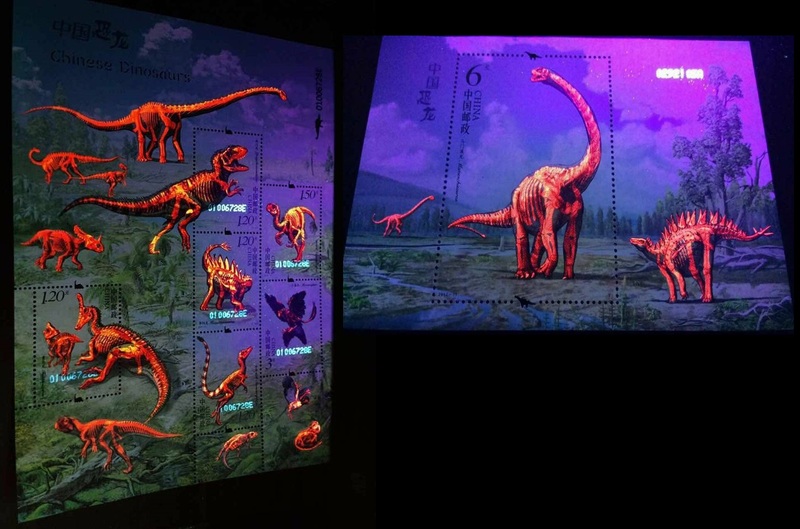 Moreover, the postage prepaid picture card, with 3D printing effect, makes the six dinosaurs more vivid. Set against the environment where dinosaurs lived in prehistoric times, the souvenir sheet in a block stamp design showcases dinosaurs from different periods. Glow-in-the-dark effect shown on the souvenir sheet after absorbing UV light.